CAN THE USA SURVIVE BY GREAT WRITER FREDDIE LEE SIRMANS SR.? I hate to say this, but I’m beginning to think the nutty bias liberal news media is making the USA ungovernable, and I believe they are out of touch with reality but fail to realize it, or maybe it is me that is out of touch with reality. The USA is being engulfed and over run in numbers by liberals and liberalism due to the welfare state producing masses of them. Plus, the welfare state has turned this great nation into a lack of discipline soft p…. society with too many people having weak survival instincts. Today people of good character and sound judgment is swimming against an over whelming tide of production-line liberalism that is impossible to overcome, there is just too many, even the poor is liberal and corrupt and killing in the womb by the millions today, which has never happened since the dawn of history. 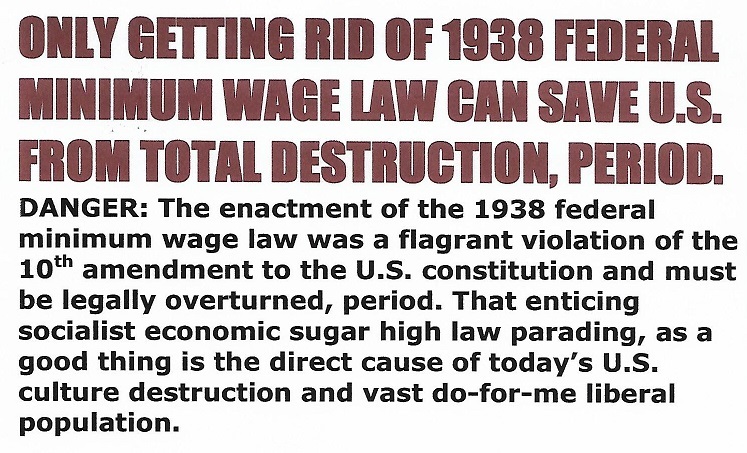 All of this USA destruction results from a lack of societal discipline due to the enacting of the 1938 minimum wage law. And I believe beyond a shadow of doubt that the USA cannot be saved until that insane arch-evil 1938 socialist minimum wage law is repealed. FREDDIE LEE SIRMANS SR. LOG: 31 OCTOBER 2017, 0247 HOURS.